Nasal polyps are painless, fleshly noncancerous growths on the lining of your nasal passage or sinuses. They vary in size and may be only one in number, but sometimes several grow like a small bunch of grapes on a stem. Nasal polyps can affect anyone. Small nasal polyps may not cause symptoms whereas; larger growths can block your nasal passages or lead to breathing problems, a loss in the sense of smell and frequent infections. Nasal polyps are much more common in men than in men. The exact cause for this is unknown. Initially, you might think you have a cold because a blocked or a running nose is a common symptom in viral infections like colds. 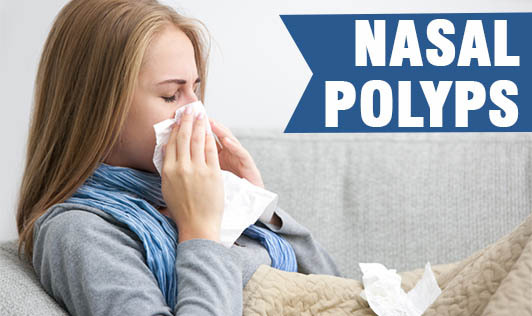 If you have nasal polyps, the symptoms will not get better without treatment. • Postnasal drip may occur. This is a sensation of something continuously running down the back of your throat due to the mucus coming from the back of the nose because of large polyps. • Large polyps may cause headaches, snoring and obstructive sleep apnoea. • In rare cases, very large untreated polyps can make your nose and front of your face enlarge. An ENT surgeon can usually diagnose nasal polyps based on your symptoms and on examination of your nose, he will be able to suggest the treatment options.